A nifty turntable that I've been playing with, the Thorens TD-160 "Super" repro from Vinyl Nirvana.. Discussion in 'Audio Hardware' started by Steve Hoffman, Jun 4, 2014. I love records, I love playing them, looking at them, smelling them, ever since I was two years old I was in love with music, mainly from records. I have a bunch of records like most of us do, and there is one thing that really is important for us collectors and vinyl lovers to remember and that is the turntable. The simple device that plays back our music. It must sound good (it must also look good) and it must, (most importantly) be gentle to our precious vinyl. These days we have a lot of choices in our turntables for $1,500.00, we can buy new, all different kinds of tables, all different price points but now, thanks mainly to Dave at Vinyl Nirvana, we also have a different choice. We can buy (for around the same money as a modestly priced new design) a CLASSIC turntable from the true Golden Age of turntables (not the 50s or 60s, dudes but 70's and early 80s) and it can be (as I found out recently) a truly rewarding experience. Dave gave me a buzz one day back in March and offered to ship one of his best sellers for me to try. This is a vintage but totally restored Thorens TD-160 "Super" reproduction table that, outfitted with a Rega (Moth-badged) RB-202 arm, is right at the reasonable $1,500.00 price point. The RB-202 arm in stock form has below average (IMO) wiring. Hums, etc So, Dave and his "arm tech" developed a Cardas-based one piece upgrade that sings, yet is not so overly stiff/bulky as to affect the suspension. Now the Rega arm has this upgraded Cardas wiring and ART Pop RCA plugs. The cart I asked him for (after reading up on MM carts around the $500.00 or so price point) is a new Ortofon 2M Black making the grand total a little over 2 grand. David's goal with his TD-160 SUPER Repro tables has been to eek out the best performance in an under $1,500.00 page while maintaining the classic look with upgraded sound. The only (for me) upgrade he added beyond the usual package is an RB-300 level stub and counterweight that will better pair with the Ortofon 2M Black MM cartridge I wanted. This would typically add 85 bucks more to the price. The wood plinth he sent is 3/4 inch solid Zebrawood. As Dave states: "A bit audacious, but lovely". If you buy the cart from Dave (he can get you almost anything), it will be mounted and aligned. You will just need to set the tracking force and anti-skate. So, the table arrived in April, packed like the crown jewels (which, knowing Dave, he considers each and every table to be, bless him) and unpacking was fun. This was an old turntable (well, not that old, but maybe 40 years) but totally restored, inside and out, just like new, beautiful looking. Smelled new, Tung Oiled plinth and all that. Yummy. The new Ortofon Black MM cart was mounted, all I had to do was install the belt, counter weight, adjust tracking force for the cart (took 5 minutes for all) plug in and put music on. I plugged the table into the MM section of the fantastic Allnic 3000 all tubed phono section and blasted out the DCC Doors S/T album that I mastered with KG back in the 1990s. I know the sound, I know what it should sound like and I was (not) surprised that it sounded WONDERFUL on the Thorens. The Ortofon cart really sings, the table is very beautiful, works like a charm and (most importantly) was lovingly restored by someone who is passionate about his work. I tried a few different phono stages with the turntable, the LA Audio MM stage from Denmark (with one Telefunken ECC83 tube in it) the Solid Stage Sutherland PhD phono stage, the little Allnic baby (four Mullards) 1201, the CAT preamp phono section (amazing sounding), an Audio Note M2 MM stage (wonderful) and the machine never disappointed. I tried my vinyl "Torture Test" lacquer to see if the arm/cart duo could handle a really tough inner groove and it passed. So this vintage table not only can play my toughest to track records, but sounds great doing it. Important to me! My system: Audio Note UK Baby Ongaku "Jinro" integrated amp into Audio Note AN-E-Lexus-HE hemp speakers with all AN wire and cables. Bottom line, if you like the classic turntable look but were afraid that if you bought a vintage table it would die on you or not be up to spec, this is your chance to get a classic table, restored to new by someone who really knows what they are doing, for a reasonable price. It's a conversation starter, that's for sure, will look and sound amazing in any system, trust me on this. Very classy and classic look. Andy Saunders, NOS300B, Catcher10 and 55 others like this. My second turntable was a TD160 Mk II (not the Super - I think that was released after I bought mine) which had a Japanese Unipivot arm and the legendary Garrott P77 moving magnet. What a great package and a huge step up from my Dual 505 Mk II. My plinth was the basic black so nothing as pretty as what you are showing - but it was a great turntable for someone who wanted to move up from a beginners deck to a much more sophisticated 'table with sub-platter + platter and spring suspension (to play with). Lots of learning was done with that deck - cartridge alignment, spring adjustment. I loved it. I had this for a couple of years and I sold the Thorens to a mate - and he must have got another 20 years out of it. Solid and dependable and wonderful sound. A pleasure to use and own. I replaced it with a Linn Sondek, which was a better sounding turntable (as you would expect). Pythonman, Campbell Saddler, ddarch and 1 other person like this. I am amazed at the sound of this table/arm/cart. Really enjoyable, makes me want to pull out record after record (and as you know, that's always a good thing). fortherecord, SandAndGlass, dalem5467 and 5 others like this. Yes it is. When I bought my Thorens, the Rega Planar 3 was an option, but I liked the old Thorens much more. Shak Cohen, ddarch and Sneaky Pete like this. 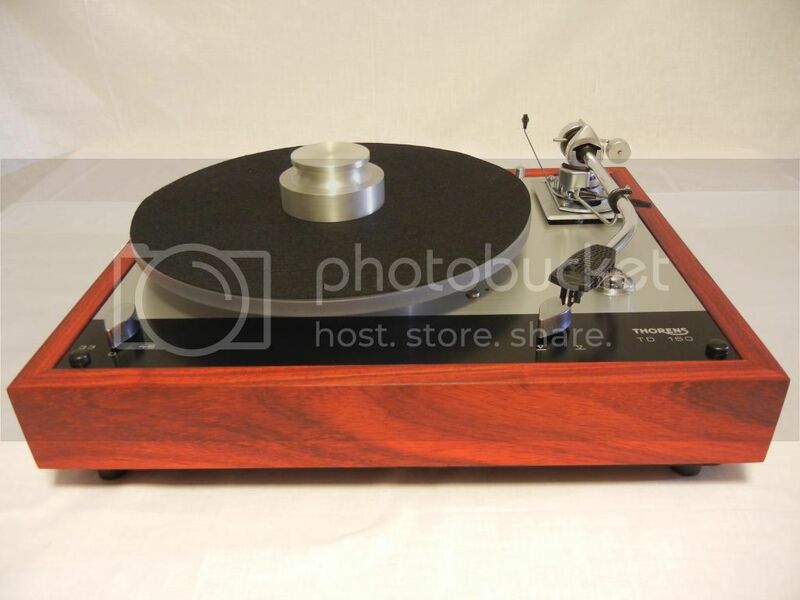 I used to browse his site constantly just looking at those beautiful Thorens of his - and his various tricks like - fathers day package save 200.00 - I already had a table - but man I was so tempted to just buy one of those. Dino, ddarch and JL6161 like this. Great post, and I love the look of that table. Absolutely gorgeous, and you can tell from the pics that it is just oozing high-quality all over the place. I can only imagine how sweet the sound is through that AN pre. Thanks for writing that Steve, something to seriously consider when/if I'm ready to jump from Rega. I've never heard anything but the highest praise for David's work. bhazen, Long Live Analog and ddarch like this. Yeah, he's a dedicated dude, no question. Loves his work and it's a good feeling to know that if one drops 2k on one of his complete packages (with upscale cart, etc.) that he's there to help, fix, etc. If a classic table is your thing and you don't want to spend $16,000.00 for one of those crazy TD-124 or Garrard restorations, this is your chance..
SandAndGlass, Dino, Long Live Analog and 2 others like this. Long time browser here, not much of a poster but I had to chime in here and agree with every comment Steve made above. I've done quite a bit of business with Dave on more than one table and not only is his work top notch, but he is an excellent business man. The definition of a self made American small business who truly puts care into all of his products and services. I am currently running a custom TD-160 that I was able to customize with Dave one on one. I could not be happier with the end result, to the point that I can safely say it will never leave my lineup. Sounds absolutely fantastic. You will not find a better suspension driven Thorens restoration specialist. Here is an older picture of mine. Only changes are the addition of a Music Hall Cruise Control 2.0 (which Dave also sells. AWESOME upgrade) and I added a bit of weight to the tonearm's headshell and counterweight, per his recommendation, to better match the SAE1000E cartridge. I could not be happier with the SME3009 and SAE combination. FYI, the plinth is a beautiful piece of Padauk wood. The plinths alone on his restorations are incredible. Pythonman, Mike from NYC, Rhapsody In Red and 12 others like this. My main turntable is still an original Thoren's TD 160 with the stock tone arm. I've never felt the need to upgrade anything besides the cartridge. It keeps making music, what more can I ask for? Jelloalien, Hubert jan, Mike from NYC and 13 others like this. Fab post, and it's nice to see Dave get another prominent endorsement. I'm constantly perusing Vinyl Nirvana just to look at the beautiful pictures and contemplate acquiring yet another turntable. I would flat out love one of those long base TD-125s, but it's great too that he has a range of options for different budgets and tastes. The little $475-500 Duals are just as gorgeous as the Thorenseseses. PGB and ddarch like this. It doesn't need to be a replacement table; it could be an additional one. raferx and ddarch like this. Nice tables and as good as anything out there if not better. I have a stock TD-145 I tuned up and mounted an AT-440mla on and have to say I know the sound. Anyway, thanks for the reviews and pics they are very nice. SirMarc, 62caddy, Ntotrar and 1 other person like this. Where is he located? Reckon he would ship internationally? In fact, he came over to my house last summer to purchase a neglected AR turntable that I was selling for a friend. He is a totally good guy and it was a pleasure meeting him. PGB, ddarch and Campbell Saddler like this. Can anyone comment on how a Thorens of this caliber would compare to my RP6/RB303/DV20x2L combo? I've only heard one similar table (AN TT-2) but in a completely different system. Cheers! "Can anyone comment on how a Thorens of this caliber would compare to my RP6/RB303/DV20x2L combo? I've only heard one similar table (AN TT-2) but in a completely different system. Cheers!" It talks about owning a P3, MH 5 and MH 7. AlanDistro, Pomodori, ZootAllures and 3 others like this. Nice! Those Thorens decks from the 70's and 80's are seriously under-rated, which comes from trying to claim the crown of the awesome TD124 I suppose. Back in the early 90's I had a TD125MKII with a TP16 arm (unfortunately not the LB version) and while I eventually traded it for a Technics SL1200 I always felt that the Thorens had more to offer than I was able to wring from it back then. hobbes4444, PGB and ddarch like this. I have no experience with Thorens TD-160's and the like, but I do have a modded AR-XA, which has a similar sprung suspension. What I like about this design is it does a great job of rejecting vibrations, both airborne and internal, and it has a wonderfully airy quality, and deep, layered imaging. SandAndGlass, LH5, Beattles and 1 other person like this. Another endorsement for Dave and Vinyl Nirvana. PGB, vinyl13, Pomodori and 7 others like this. I love the no nonsense simple look of those tables. SandAndGlass and ddarch like this. Those are neat, I had one for playing 78's for many years. Stunning tables !! thanks for all the photos .